(Followers of crime fiction will also recognise this particular trope). Once Gallio begins tracking down the remaining disciples, however, they begin dying thick and fast. Again, this is a common feature of crime novels, where the killer’s victims pile up as the detective hunts him down – that Beard draws on Christian tradition (cherry-picking the disciple’s most gruesome deaths) echoes the violence of the most sadistic fictional serial killers. 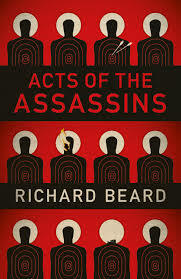 Beard’s novel is also, of course, a political satire. The hunt for Jesus unavoidably brings to mind that for Osama bin Laden. His followers are regarded as a dangerous sect; their willingness to die for their beliefs the most dangerous thing about them. They are being blamed for the recent fire in Rome. At one point, the phrase ‘ground zero’ is used. As the novel progresses, the terror threat level rises. In Gallio, the novel explores what happens when the rational (and what could be more evidence based than police work?) collides with the inexplicable. All of these elements have been woven into an exceptional novel, one that fully deserves its Goldsmiths Prize shortlisting. You are currently browsing the archives for the Richard Beard category.